After painting a number of small pieces, it is time to start a big piece. 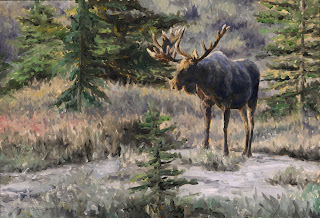 Rarely do wildlife artists paint animals larger than life. (kind of hard to do with an elephant or blue whale.) It is done so seldom that I remember one conversation I had with artist Mort Solberg at the Birds in Art show, Leigh Yawkey Woodson Art Museum. 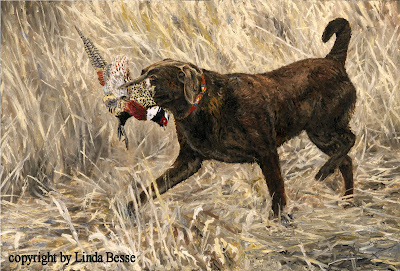 He commented that he liked my painting Bobwhite Quintet and that it was "gutsy" of me to paint the Northern Bobwhite larger than life size. I knew I wanted to paint a large leopard piece. 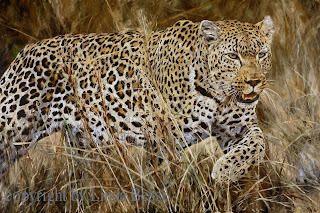 As I worked on the composition, the leopard kept getting larger and more cropped. Something about him just called to be "in your face." At this stage, I am just starting to paint in the underlying turpentine wash.
Photo I took from our deck just outside from the kitchen. And no, we are not eating any of our wild turkeys for Thanksgiving! Well, maybe I should say small paintings. I find playing with sizes less than one square foot interesting. With a small working space, I can try out ideas and use different styles. 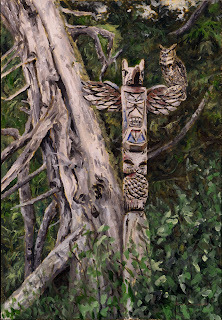 This painting is loose and I worked to bring in an expansive feel in a painting less than 7 inches high. As you can see from the tiger painting Cool Stripes posted below, I used a tighter style especially around the cat's face. Another advantage to these types of paintings is that it gives me a breather from major "statement" pieces. I can work out problem areas as I go and don't need to have all the painting decisions made before I start. 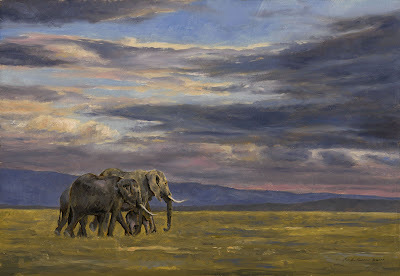 For instance, in Pachyderm Parade my reference had a lot more vegetation to the right of the lead elephant. I decided to take out the dense bushes to enhance the feeling of space. When I did my underlying sketch I put no detail in that area and then winged it. I also bumped up the contrast on the elephants. Countless other decisions were made on the fly. In pieces of a medium size, 18" X 24", or large ones over 6 square feet, I spend a lot of time in the planning stage working out just how I will tackle certain areas before I even pick up a paintbrush. These small paintings let me try out fresh and intriguing paths and let my often logical intellectual approach take a back seat. You are in luck! This weekend, November 13th, 14th, and 15th is the Waterfowl Festival in Easton, Maryland. 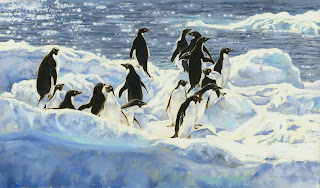 I will be exhibiting 21 new original oil paintings at The Elks. 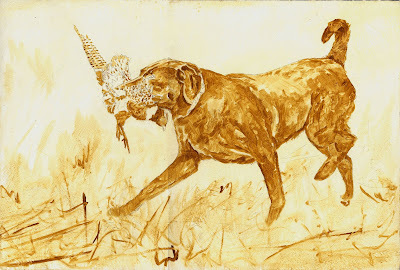 There is also another building of fine art paintings (The Tidewater Inn), 2 buildings for sculptures, a large building for carvers, dog trials, raptor demonstrations, goose and duck calling contests, great food, and more. Tigers almost demand to be painted. This largest feline has a magnificent coat and likes water. 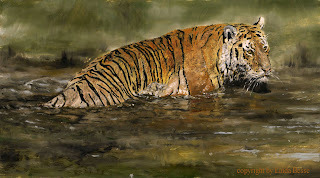 Since I adore cats and enjoy painting the many moods of water, I find the "tiger in water" painting one of my very favorite subjects. Tonight I will be singing in the Fox Theatre with the Spokane Symphony Chorale. This is an auditioned group of 83 selected to sing with the Spokane Symphony Orchestra. This evening will be a bit different. Rather than singing with the Orchestra, the Chorale’s pieces will be a capella (with some organ accompaniment on two pieces), and the Orchestra will have their own pieces. All of our pieces are sung in Latin. On the final piece, I was selected to be one of the 3 altos in the small group of 12 singing from the balcony. The main chorus, the chanters, and the small group sing at different times in the work until the end when we finish in 9 part harmony. The Theatre holds approximately 1600 people and we expect to have a good audience tonight. Well, maybe not fast, but loose. 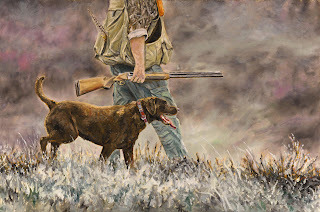 After completing a painting like Good Day of Hunting with lots of intricate detail, I like to change it up by working with a more impressionistic touch. In the Ngorongoro crater bottom I saw this group of lionesses. Midday, they were taking their ease. Of course I took lots of reference photos, but more importantly, I just watched them. The challenge in the painting was to figure out which positions I would use and how many of them would be included (I left some out) to capture that siesta moment. I just returned from a 17 day trip to Alaska. This was a special trip because it was with my husband and my parents. Dad just turned 85, and he and Mom have been married almost 52 years. What great fun we had. We started in Anchorage, then headed down to Seward, "catching" the Exit Glacier before grabbing the ferry in Whittier to Cordova. We arrived in Cordova just in time to catch a day when it officially rained 5.5 inches. Some would bewail their bad luck. Not this foursome. The heavy rains meant that the rivers and waterfalls were wildly exciting. I’m sure you don’t want all the stories from the trip, but I’ll share a few highlights. We drove about 2000 miles the first 10 days. Dad and Jim climbed up to and on the Worthington Glacier.... in the pouring rain. It rained parts of every day EXCEPT the 2.5 days at Denali when our main trip into the park was crystal clear and the mountain, magnificent. Jim and I followed a very nice family group of ptarmigan in the tundra through the mist and low clouds. Some of the birds came within a few feet. I envision some moody paintings from that encounter. Fortunately, we had a number of good close views of caribou (especially fun as Mom and Dad had not seen them in the wild before.) Several times we were close to cow moose with calves, and we saw some particularly large bull moose at Denali. Birds included Northern Harrier, Bald Eagle, Short-earred owl, Great Blue Heron, Tundra Swan, and Grouse. Held at the Bennington Center for the Arts, Bennington, VT, this show was judged by internationally recognized artist Albert Handell. What an honor to have my painting, Leaving the Harbor, juried in. The show runs from September 19th - November 29th, 2009. When I saw this fishing boat leaving the harbor in the late afternoon, it had such a nostalgic feel. The nets, the warm sun on the deck, the rigging, all the contributed to a sense of timeless purpose. Men gathering bounty from the sea. 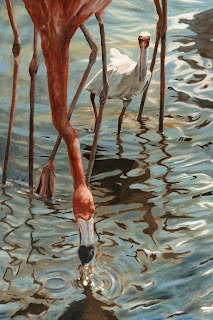 I recently returned from the Oil Painters of America Western Regional Show. It was refreshing, inspiring, and humbling to have a painting among the chosen. Very few wildlife pieces - you could count them on one hand. The show consisted of 150 paintings, most were still lifes and landscapes. A wonderful landscape is Calvin Liang’s Gondola, Venice. The subtle lighting and brilliant use of oranges and yellows is unfortunately not apparent in the image on the web. The still life which caught my eye was Elizabeth Pruitt’s Lilacs and Lace. The soft edges were masterfully handled. In addition to the show reception, we had seminars throughout the day including an insightful oil painting demonstration by judge, Jeff Watts. 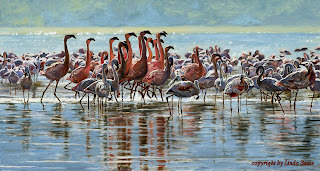 The Oil Painters of America Western Regional Exhibition opens tomorrow at the Howard/Mandville gallery in Kirkland, WA. Located near Seattle, this show will run at the gallery from August 8th to August 30th. The gallery is located at 120 Park Lane, Suite D.
was accepted for the show. 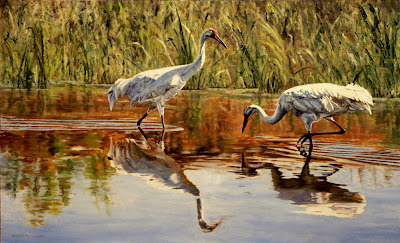 In August 2008, I was accepted as a member of the Oil Painters of America. Since then, I have had a painting accepted for the first regional and national shows I have entered. For the leopard, I painted the spots first. The surrounding color was next and then I went back and touched up the spots. Putting in the "black" spots first helps me get a feeling of how the underlying muscle structure can be portrayed which then aids in the shading. With a leopard this small, it was inevitable that my background shading on the leopard’s body would cover the edges of the spots I had just painted. Hence, the spot do-over. 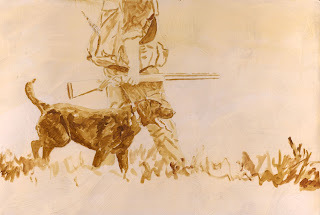 One of the problems of working wet on wet is that, well, it is wet. How do you paint detail in the center of a painting when resting your hand on the board will smear your work? This problem was solved was by my ingenious husband who saw me struggling to paint with my right hand while it was steadied in the air by my left. He built me an easel and the best feature is that my hand now rests on an ergonomic board which can be moved vertically to any position. On to the painting. I have finished the haunch of the zebra. I saw this leopard coming down the tree in the Serengeti and there was no zebra. But, I really like leopards and I thought I’d give him dinner. Also, I liked adding an element which enhanced the story. I am not the only artist who has heard that it must be "so much fun" to paint. Many times it is. But there are times when it can best be described as tedious drudgery. A professional singer does scales. A football player runs drills. A student works on his calculus. None of these activities could be considered "fun." But, they are necessary to achieve the final result. The perfect pitch aria, the touchdown, the.... well, maybe calculus was a bad example. A "this is no fun" mantra accompanied painting some of the foliage and smaller branches. I couldn’t just blob on the green if I wanted that airy feeling of the acacia. So, it was slogging through it, bit by bit to achieve just the tone I wanted. 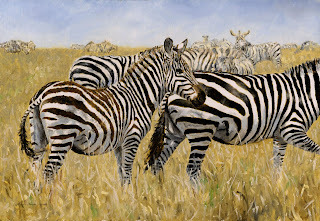 The next step is to paint the zebra and leopard.